On April 19th, McDonald’s announced it was hiring 50,000 new employees in one day. I thought I’d share an example of what such experience can become on a resume. I’ve made this anonymous, stripping away some telling details and metrics. This worked very well for a client, and shows that a “McJob” can become a solid entry on your resume. Instrumental in marketing, business development, and daily operations of high-volume restaurant. Supervised 75 employees, from managers to first-time, entry-level employees. Managed hiring, performance evaluations, personnel actions, scheduling, cost control, ordering, inventory management, and cash handling. Introduced several new community-based marketing initiatives, including lunch programs at local schools, bike safety events hosted by McDonald’s and local police department, and local tie-ins with national promotional campaigns. Created incentive and peer review programs to reduce absenteeism and turnover. Promoted to management from initial hire as counter person/customer service. Demonstrated initiative, professionalism, and desire to take on greater responsibilities. 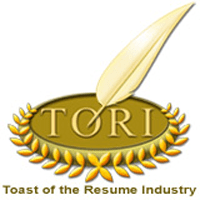 I’ve been featured as a resume reviewer at events for CareerBuilder, Jobing.com, Women for Hire, the San Diego Union-Tribune, and a few other organizations (and I’m happy to consider additional appearances—contact me!). I thought I’d share some tips for professional resume writers, career coaches, HR pros, and others gearing up to review resumes at job fairs. You will be the most popular person in the room. Any given employer at a career fair will attract a subset of candidates—but everyone will want to know if their resume is up to speed. Keep moving. Don’t get bogged down in minutiae—identify the most significant issues, which will be a tremendously valuable service to candidates. It’s like triage: treat resume-killing problems and move on. I use a small hourglass (see equipment list below) to remind myself to come up for air. Watch out for “one more question…” and those who would monopolize your time. Again, an hourglass is a useful signal. Here’s a list of items I bring when I’m appearing as a resume reviewer, not giving a speech or presentation. As an ex-Boy Scout, this list is heavily informed by the Scout Motto: Be Prepared. Cash for parking, just in case. It’s obnoxious when event organizers don’t cover this, but it happens. Business cards. As many as you might think you need, then double that amount just in case. Business card holders. Arrange on display table so people can serve themselves while passing by. Signup sheet for names and email addresses. This enables me to follow up with visitors, add subscribers to my newsletter, and possibly convert them to clients. Drop box for resumes. A long line will form; having a drop box is an excellent way to cut down the line, free people to network at the event, collect resumes to review on your own time, and follow up with them. Signs identifying your company. Bring your own to ensure optimal branding—and to ensure you don’t suffer from an event organizer misspelling your name or omitting your website’s URL. Nametag/business card holder identifying you. Extra pens. The first one will stop working as crowds begin forming. Wristwatch, egg timer, or hourglass. Display posters and stands, branded. Gives people something to look at while they’re in line, and maybe you can address FAQs this way so you don’t have to repeat key ideas fifty times. Booklet of sample resumes. Keep an eye on this so it doesn’t walk off. Books or a printed bibliography. I refer people to these for information beyond the scope I can address in the short time I have. It’s also a good idea to feature books you’re published in. Bottled water (pay attention to your voice, and stay hydrated). Spare dress shirt and slacks/spare business attire (in case of spills/accidents). I’ve been quoted in AOL News this morning about Charlie Sheen’s ad for a Social Media Intern, specifically to address whether that internship would make or break one’s career. Of four “experts” quoted in the story, I’m apparently the only one who thinks it could be an asset to the intern’s career. Here’s why: the intern is going to get a graduate course in managing social media on an epic scale. The numbers are amazing. Apparently Charlie Sheen’s set a Guinness World Record for reaching one million Twitter followers in only 25 hours and 17 minutes; as of this writing, he has 2,265,408 followers and they seem to increase by 2,000 every time I hit ‘Refresh’; and the internship ad itself has 12,326 Likes on Facebook (also increasing by a few hundred every time I look). The intern will be dealing with–and learning from–an unprecedented social media firestorm. If the intern learns to manage even a fraction of it well, that will be a remarkable achievement. What other client would present a challenge on this scale? Add the media contacts and the recognition (or notoriety) that come with the position. “Social Media Experts” might be a dime a dozen–sometimes it seems every new college graduate publishes a guide upon graduation–but “Charlie Sheen’s Social Media Intern”? There Can Be Only One. Uniqueness opens doors. Then again, it’s telling that Charlie Sheen’s longtime publicist quit the position a few weeks ago. The Ph.D. in Social Media from this internship might also be an advanced course in enabling someone’s self-destruction. It’s hard to tell how much is publicity stunt, how much is genuine illness. Increasingly, and unfortunately, that’s showbiz. Finally, I can say the overhaul of the site is underway. I’ve installed WordPress as a content management system, and ResumeGuru.com is evolving into a resource for delivering answers tailored to your needs and managing your career. Things look a little bare around here right now, but I’m working hard to finish the foundations. Please ignore the hammering and sawing sounds. Much more to come in a few days.